French researchers hoping to get an early warning on pollution in the ocean have found an unlikely ally in a mollusc more often destined for the dinner table. Their findings reveal that much like canaries in a coal mine, oysters stationed near offshore oil platforms can detect minute amounts of hydrocarbons as each one constantly filters dozens of gallons of water every day. That could alert scientists to tiny infrastructure cracks before they become catastrophic oil spills that threaten wildlife and coastal communities. Attached to rocks or other supports, oysters are ideal for nearly real-time analysis because “they have nothing to do except notice the surrounding noises and temperature and light variations,” said Jean-Charles Massabuau, a researcher at France’s CNRS scientific institute. Working with the University of Bordeaux, he has been developing processes for measuring an oyster’s reactions to exposure to oil and natural gas in the water since 2011 alongside biologists, mathematicians and computer specialists. The bivalve “is perfectly made for sampling the quality of the water it filters all day long” as it reacts almost instantly to the slightest amount of oil, Massabuau said. To study the reactions, he and his team have come up with an electrically isolated aquarium using concrete and plastic foam blocks, old bicycle tube tires and tennis balls at the world’s second-oldest marine research station, on the Bay of Arcachon in southwest France. 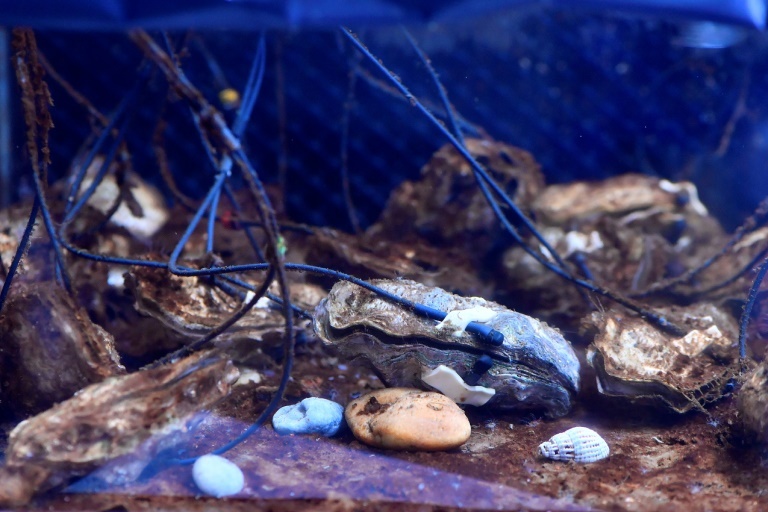 Electrodes are attached to about a dozen oysters in the tank, allowing researchers to measure how quickly each oyster’s valves are opening and closing to filter the water for food. Spikes in valve cycles are the first alert that the mollusc has become stressed, with larger increases corresponding to higher hydrocarbon concentrations. The observations have been tested in areas including the Barents Sea off Norway and Russia, as well as canals built for a research facility operated by the French energy giant Total outside Pau in southwest France. The technology’s potential captured the company’s attention in 2012, when it began partnering with the lab and providing financial backing. Philippe Blanc, who heads anti-pollution efforts for Total, said it could help protect marine environments from “silent leaks” at its installations. So far it has invested some 1.7 million euros ($2 million) in the oyster sentinel research. Following a 14-month test at its Abu Al Bukhoosh oil field off the coast of Abu Dhabi involving pearl oysters, Total now plans a similar project for the Al Khalij block off Qatar. But Massabuau cautioned that despite its enthusiasm about promoting an environmentally conscious image, Total could find its partnership with his lab a “double-edged sword”. “The oysters can tell us a lot of things,” he said, saying that he wanted his work to be a “credible guarantee” and not just a “scientific stamp of approval” on Total’s operations. That would happen only if “the company pledges to work closely with the lab to completely and transparently fix any eventual pollution risk as soon as it’s detected,” he added. “Because my problem is how to clean up the sea, as well as companies,” he said.